… as opposed to “Irish Cream” scones, unfortunately. The recipe says that the better the cream you use, the better the flavour. The best I could do was cream from Kawartha Dairy, and that was only because we happened to stop at the Victoria Street Market on our way back from the local restaurant supply store, where we needed to pick up vacuum sealing bags. Otherwise, it would have been Sealtest: the stuff made by mixing milk from just about every dairy in Ontario. Maybe someday Eby Manor will start making cream, and I can see if there’s a flavour difference with fancy pants local small-batch cream. Anyway, this is a super quick and super easy recipe to put together. Add the cream and honey (and in my case, lemon oil because I had no lemons for zest). Stir. Knead lightly, and press into a round shape. A cake pan works well, but a roughly round shape was fine with me. I knew when I started that Jay would hate them, because they contain raisins, but I’m not about to let that stop me from enjoying them. I like these, because they’re even easier than biscuits or traditional scones, because you don’t need to cut in any butter. Less muss, less fuss, and just as good of a finished product, in my opinion. I’ve eaten 3 already this weekend, and I’ll bring the rest in to work tomorrow morning. They’ll make a good breakfast with morning coffee. Oooh… I’m just remembering… I brought some apple butter and grape jelly in for Thursday lunch a while back. I’ll have to remember to go hunt that down from the fridge on my way upstairs tomorrow. That’ll be a good way to kick off what I expect to be an extremely long week at work. 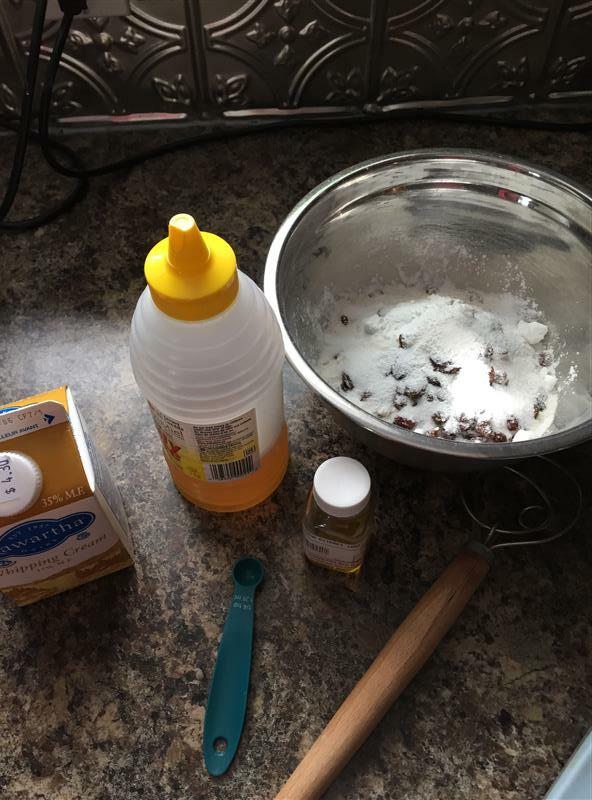 Posted on February 1, 2016 by KristinaPosted in The Baking BibleTagged raisins, scones. “Less muss, less fuss, and just as good of a finished product”- that is it exactly! Lucky co-workers having these brought in to the office. 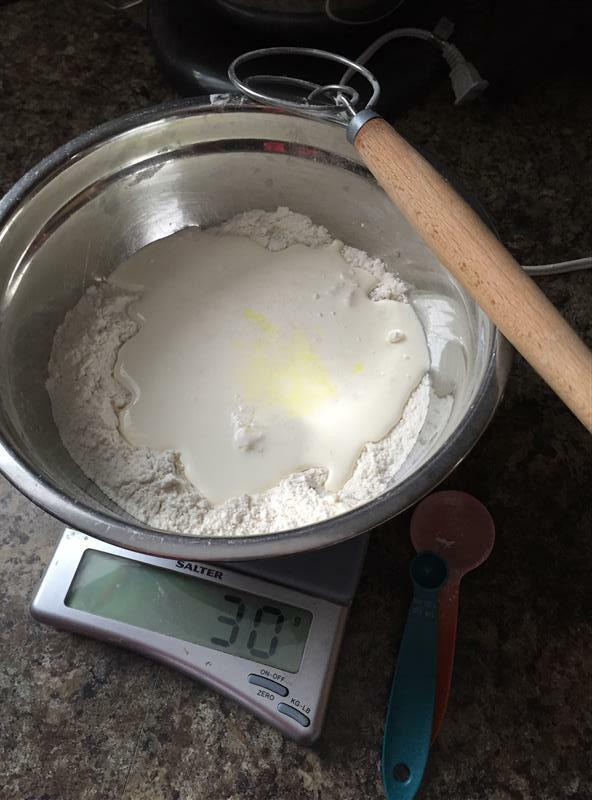 I didn’t think to use the dough stirring thing; glad you posted a picture. 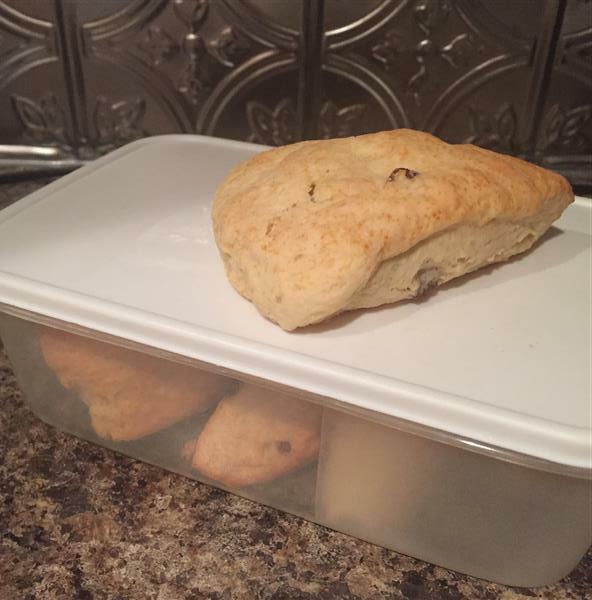 These are definitely my go to scone recipe now. 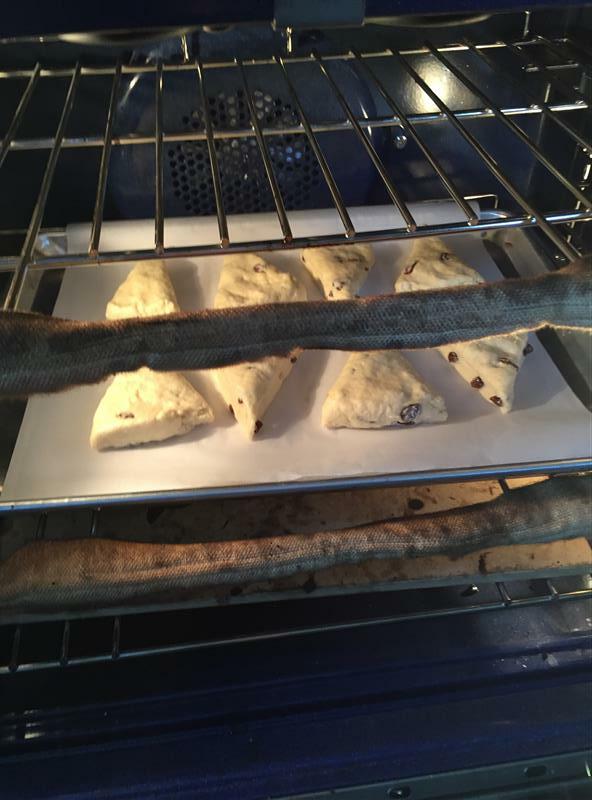 Your scones look perfect. I’m wondering if adding vanilla bean and vanilla, without the raisins, and a simple vanilla powdered sugar frosting drizzle would replicate the amazing ones Starbucks used to sell? This seems to be a recipe that could be flavored all sorts of different ways, especially sense you used lemon oil then orange oil would work, too, yes?